The United States is struggling to live up to its ideals in the area of racial, social and economic inequality, which is negatively affecting the exercise of the rights to freedom of peaceful assembly and of association, a United Nations human rights expert said today at the end of his first official fact-finding mission to the country. “People have good reason to be angry and frustrated at the moment,” said Maina Kiai, the Special Rapporteur on the rights to freedom of peaceful assembly and of association in a statement. “And it is at times like these when robust promotion of assembly and association rights are needed most. These rights give people a peaceful avenue to speak out, engage in dialogue with their fellow citizens and authorities, air their grievances and hopefully settle them,” he added. In more recent times, the Special Rapporteur noted, “old philosophies of exclusion and discrimination were reborn, cloaked in new and euphemistic terms,” such as the so-called “War on Drugs” and “three strikes” sentencing policies. The effects of harsh law-and-order policies often snowball, he added, with a minor criminal conviction – or even an arrest at a protest without substantiated charges –making it difficult to find a job, secure a student loan or find a place to live. 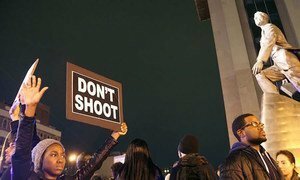 “There is justifiable and palpable anger in the black community over these injustices, which needs to be expressed,” he stressed, explaining that this is the context that gave birth to the non-violent ‘Black Lives Matter’ protest movement. The situation of migrant workers throughout the United States is characterized by the precariousness and exploitation of their employment situation, retaliation for drawing attention to adverse working conditions and a fear of taking action to seek improvement of the violations, he said. The independent expert further noted the lack of robust labour rights protections as a major hurdle to exercising the right to freedom of association in the workplace, noting that he was “shocked” to see that in states such as Mississippi, the lack of unionization and ability to exploit workers is touted as a great benefit for employers. But the Special Rapporteur called the United States a “nation of struggle and resilience,” and had high praise the civil society sector, calling it one of the country’s greatest strengths. During his 17-day visit, Mr. Kiai met numerous officials at the federal, state and local levels and members of civil society. A final report on the visit will be presented to the Human Rights Council in June 2017. Special Rapporteurs are appointed by the Human Rights Council to examine and report back on a specific human rights theme or a country situation. The positions are honorary and the experts are not UN staff, nor are they paid for their work.